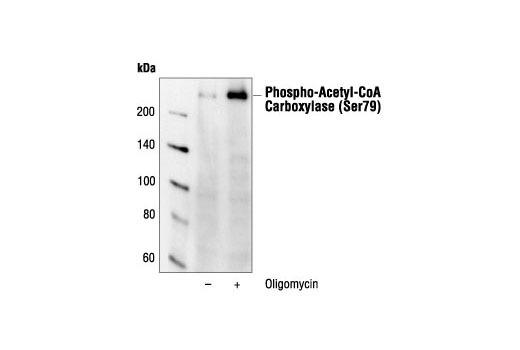 Western blot analysis of extracts from HEK293 cells, untreated or oligomycin-treated, using Phospho-Acetyl-CoA Carboxylase (Ser79) Antibody. 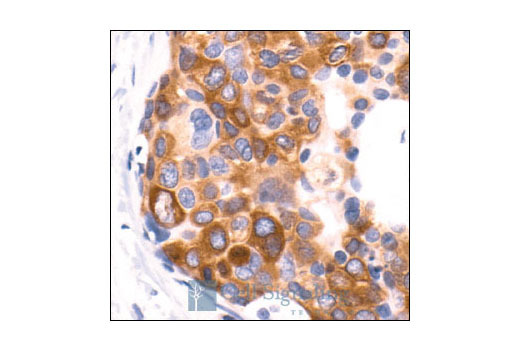 Immunohistochemical analysis of paraffin-embedded human breast carcinoma, showing cytoplasmic localization, using Phospho-Acetyl-CoA Carboxylase (Ser79) Antibody. 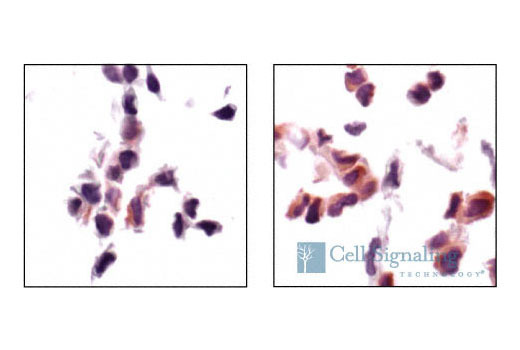 Immunohistochemical analysis of paraffin-embedded NIH/3T3 cells, untreated (left) or serum-starved (right), using Phospho-Acetyl-CoA Carboxylase (Ser79) Antibody. Phospho-Acetyl-CoA Carboxylase (Ser79) Antibody detects endogenous levels of ACC only when phosphorylated at serine 79. The antibody recognizes both ACCalpha and ACCbeta. Polyclonal antibodies are produced by immunizing animals with a synthetic phosphopeptide corresponding to residues surrounding Ser79 of rat ACC. Antibodies are purified by protein A and peptide affinity chromatography. Fullerton, M.D. et al. (2013) Nat Med 19, 1649-54. Hadad, S.M. et al. (2009) BMC Cancer 9, 307.